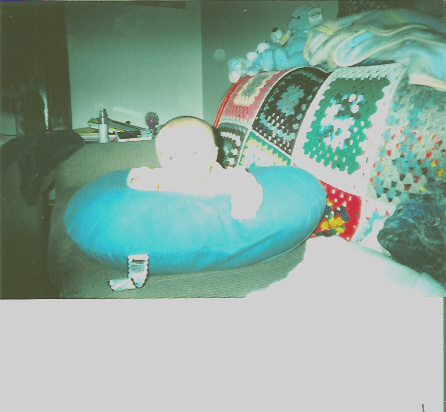 Uploader comment: I took this photo of my son about 3 weeks ago, I see 3 orbs, one in the corner by the stuffed animal, one above his head, and one half hidden by the wood work on the left side. The ecto is near the top. Camera used was a walgreens loyalty camera, 35mm, 400sp film. I had to play with the color some to bring the ecto out on the scan. That is not ecto on your picture, but the flash of the camera streaking across the wall in the back and also explaining the "orbs". If you are calling the bottom, front of the photo the "ecto", that is just an underdeveloped picture or poor film. I'll give you ecto! What a load of nonsense! Ive seen it all now! Its light in the camera!!!!!! ya know there is no reason to get snotty, I am just giving my opinion on a pic I took. Great upload, this is the reason the site is here correct? If you don't know ask questions. I don't see the ectoplasma. I do see round objects and not wanting to call them energy masses. I hope your son doesn't know how to roll yet. If you think you might have caught something keep taking photos... I know the best for me has always been digitals. Good luck and keep posting because I at least am interested.